CakePHP provides a lot of functionality. If you follow its naming conventions and practices as outlined in The Book, you get the functionality without having to write a lot of plumbing code. The worked examples walk you through the basics of creating a CRUD application. The problem I have with CRUD applications is I am not convinced that they exist. I have never been tasked with creating an application that merely creates, updates and deletes data. There is always a reason to collect the data and often this reason will result in some processing, which may be reports, operations, monitoring etc. Methods that act on data are situated in the model layer. Validation rules that are specific to an operation can be separate from the associated table model. Take advantage of CakePHP view form and validation mechanisms without involving the controller. The first step is to create a new file to define your model, ensuring that it inherits AppModel. For the purpose of this tutorial, I have appended Operation to the class name for table-less models. You will most likely have your own naming convention/company style. The useTable member of the class should also be initialised to false. This stops some of the CakePHP functionality from activating, scanning your database and declaring a schema. You will do this manually. With a schema and known fields in place, you are already on your way to being able to use the form helper to generate input for this model automatically in your views. To this end, we shall now add some validation rules. The validation rules are defined as another associated array, just like a regular model. You can use a combination of built-in CakePHP rules or use your own custom rules. I have provided the validation rules in long form. It is something I tend to do when developing with CakePHP for my own code consistency. The only custom validation rule is that of category ID. In this simple example, the categories will be a static array list provided by the model being defined. A real application would likely retrieve these categories from a specific data provider. That being said, the validation method and a get list method are presented below, add them to your ‘ContactOperation’ model definition. Additional rules can be added according to your preference. You may have a banned list of e-mail address, in which case a validation rule could verify the existence of the address on this list and behave accordingly. This list may be external to your application. The methods shown here are illustrative of the framework in operation. I am certainly not suggesting you adopt it as ‘good practice’. You have choices when defining the controller. 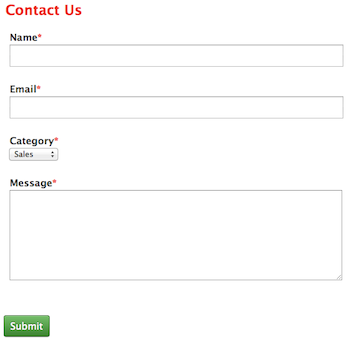 You could provide a specific controller for the purpose of contact form operations. You could create a method in an existing controller and create a route for it. 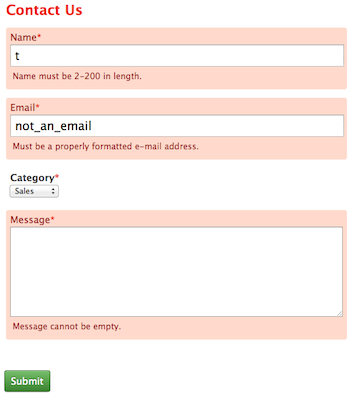 I shall use the example given in DerEuroMark’s blog post on the Contact Form Plugin. Define a new controller called ‘ContactController’ and have it extend ‘AppController’. E.g. // redirect to root '/'. // display the form with errors. This method is very simple. The controller checks to see if the request is a post and attempts to validate the form. Upon successful validation, it’s time to send an email, say thanks and do whatever is required after using the contact form. Should the form not validate, it will use the view form helper to tie into the validation errors and have the displayed side by side with the input controls, the usual CakePHP affair. The model is initialised at the start of the method using the ClassRegistry static class. Before the view is rendered, the categories are assigned to the view from the model method you defined earlier. This is regular CakePHP naming convention and ties the list with the input control and remembers user selection. If you put some data into the inputs that purposefully trip the validation methods, you can see how CakePHP has automatically hooked your model logic into your view. The technique demonstrated in this post can be used in most business scenarios. I often find the table-less model approach to be much cleaner and less muddled than trying to pin a multi-model operation onto one model and managing the relationships. Using a table-less model, you get to define your behaviour and validation within the context of the operation, while maintaining the stand alone validation. To extend this idea, you can then implement the save methods inherited from model, or write your own application level method. For example, the code to send an email could be presented as a method in your ContactOperation model. For something more general, such as this contact form, you may wish to produce a set of plugins and tools for use across various projects.